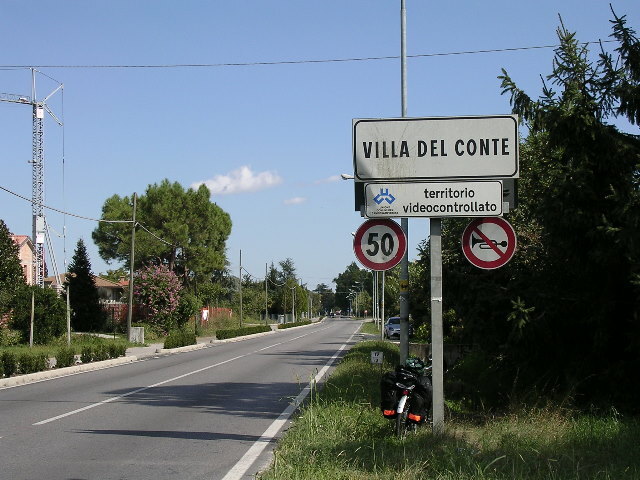 Paul Delconte Cycling in Italy - Welcome! This is a short day by day description of a bike trip through northern Italy by one of my cycling buddies, Paul Delconte. Most of the descriptions are simply taken from Paul's e-mails to me. Paul was born in Italy, but moved to Canada at an early age - this bike trip is like a trip back to Paul's "roots". Because Paul is fluent in Italian, I have also included his Italian transcripts. I have done some editing (except for the Italian translations, for obvious reasons) so the e-mails are a bit more "readable" in places. I hope Paul does not kick me when he gets back. This cycling trip has finally arrived! I fly out tomorrow to Munich and then rail to Bolzano to where the cycling begins. Below are links that show the routes I'll be primarily following. I've set up this yahoo address and will try to email out a daily summary on the day's events with some photos. Hope to get the first message out Saturday from Bolzano. Finalemente, questo viaggio e arrivato! Parto domani per Monaco e poi a treno per Bolzano dove iniziera il percorso. The flight to Munich went well. My bike arrived with panniers (excellent!). There was minor damage found on the bike. The mounting strap that holds the Reed switch for the cyclometer broke. Used good 3M duct tape for the temporary fix. I had a little difficulty finding the Subway ticket booth at the Munich airport and the train to Munich's main Bahnhof (train station). I also encountered a problem with the train reservation to Bolzano. This train does not take bikes. I made alternate arrangements, booking another train that does take bikes. This one left 2 hours later than the initial booking. Munich was cool (13-15C), overcast and rain. The rail trip was enjoyable, through Bavaria into Austria (with a stop at Innsbrook) and the beginning of the Dolomite mountains and entered Italy at Bennero (Brenner). I arrived int Bolzano at 9:30 pm. Weather conditions for today's ride were excellent - sunny, with temperatures comfortable in the low twenties and little wind. The complete ride was in the Adige river valley. No climbs and the scenery was spectacular. I found the bike path that links Bolzano with Trento about a quarter into the ride. It is an easy and safe ride ..... just followed the path and it took me straight here (Trento). (Tom and Kevin - this ride is very much the same as what we rode on along the Danube, only with mountains on each side). Unlike today's ride, tomorrow's to Bassano di Grappa should present some difficulty as I'm expecting to do some climbs. I will try to send an update from there tomorrow. Il vuolo a Monaco e andata bene. La bici e i panniers sono anche arrvati (meno male). Ho trovato un piccolo guasto sulla bici ( in riguardo del cyclometer). Usando un pesso del famoso 3M "tape", tutto aposto. Nessuno problema a trovare il treno per la stazione centrale di Monaco. Soltanto un problema con il prenotato treno per Bolzano. Questo qui non porta i bici. Ho dovuto cambiare treni e il nuovo partenza era 2 ore dopo di quello in principio. Dunque, sono arrivato a Bolzano alle 21:30. Monaco era fresco, temperature di 13-15 gradi, nuvoloso e piova. Il viaggio a treno era molto piacevole, traversando Baveria, Austria (una fermata a Innsbrook) e il inizio delle montagne Dolomite. Ho entrato Italia a Bennero. I condizioni per il percorso oggi erano ottimi, sole, temperature confortabili tra 20-23 gradi. poco e anzi null di vento. Il percorso era nella valle del fiume Adige. Non erano di salite di confortare e la vista era meravigliosa. Poco fuori di Bolzano, ho trovato la pista a bici che collega Bolzano con Trento. L'ho seguito bene, molto commodo e sicuro e mi ha portato a Trento. 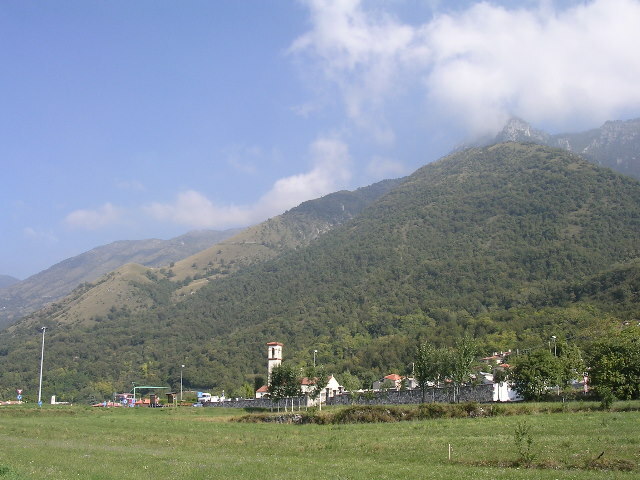 Il percorso domani e previsto con qualche difficulta ( montagne di salire). Provarò di spedire un racconto domani da Bassano di Grappa. I did not make it to Bassano del Grappa, there is about 25km more to go. I got to Asiago about about 4:00 pm and I spent most of the day climbing. The morning was very difficult, right out of Trento. I only covered 26 km in about 4 hours! I was able to deal with with the climbs for about the first 2 hours, but eventually I had to start walking the bike (where it was too steep to pedal). There were a lot of winding upward roads on this route that helped with the inclines. But the climbs just seemed to go on and on .... There were some descents and they were greatly appreciated! One major decent just beyond the Val Vanesse (mountain pass) was a good 30 min downhill ... quite enjoyable. The weather conditions noticeably changed entering this pass. Before entering, the temperatures were a confortable 16-18 degrees and little wind. This changed to a moderate head wind from the east (10-15km/hr) and temperatures dropped to about 10-12 degrees. The whole day was overcast. I can now say I crossed one of the Dolomite mountains .... I doubt if I'd try it again. Asiago is in a valley. Before leaving Trento, I had to retighten the mounting screws for the pannier hooks .... I found them loose. In reviewing the map, there still remains 2 "light" climbs before arriving in Bassano del Grappa. I'm still planning to reach Venice tomorrow, which will likely mean covering about 100 km. This will likely leave me little time to sight see Venezia. I hope to send an email out tomorrow. Attached are a few pics. Non ho potuto di arrivare a Bassano del Grappa. Sono arrivato qui alle 16:00 ed avevo ancora 25 km di strada. Ho passato quasi tutto il giorno a salire. La mattina era molto difficile, subito fuori Trento. Ho compiuto soltanto 26 km in 4 ore. 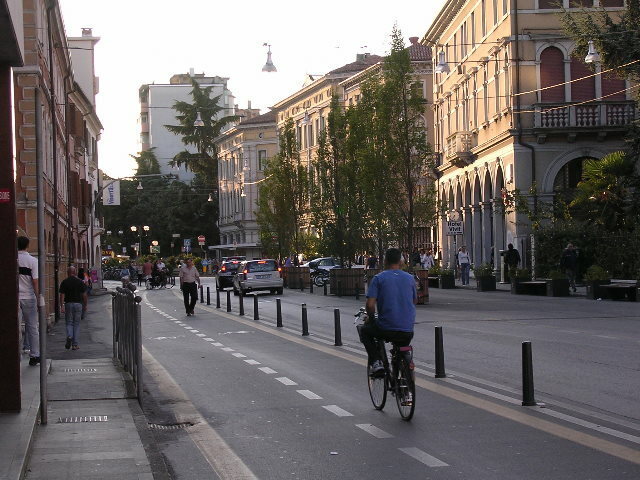 Era soportabile per il prime 2 ore e poi ho dovuto di caminare la bici dove era troppo di salire. Il percorso aveva molto strade che giravano in modo di aiutare, pero di salire non voleva cessare. Erano anche qualche dicese..... menio male. Particularmente, uno che ho godato per circa 30 min poco dopo di entrare il Val Vannese. Prima di entrare il val, il tempo era confortabile, temperature di 16-18 gradi e vento debole. Ma ha combiato, in verso male, con un vento diretto orientale da 10-15 km/ora e la temperatura e dicesa a 10-12 gradi. Il giorno e stato nuvoloso. Almeno poso dire che ho traversato un dei Dolomiti. Prima di uscire Trento, ho osservato un piccolo problema com i pannier e ho dovuto di ajustarli. Ho studiato la mappa. Ci sono ancora 2 piccoli posti di salire per arrivare a Bassano del Grappa. Voglio arrivare a Venezia domani, che fare di circa 100 km di percorso. Non aspetto di non aver molto tempo di vedere Venezia. Spero di spedire un emial domani da Venezia. PM partly sunny, cool 10-12C, moderate head wind 10-15km/hr, fewer climbs, major decent of about 30 min. Paul was unable to find a computer to transmit his September 11 dialogue. So, he sent both reports on September 12. I could not find a PC to use yesterday. Here's a brief account of yesterday's and today's ride with some pics. I didn't quite reach Venice this day. 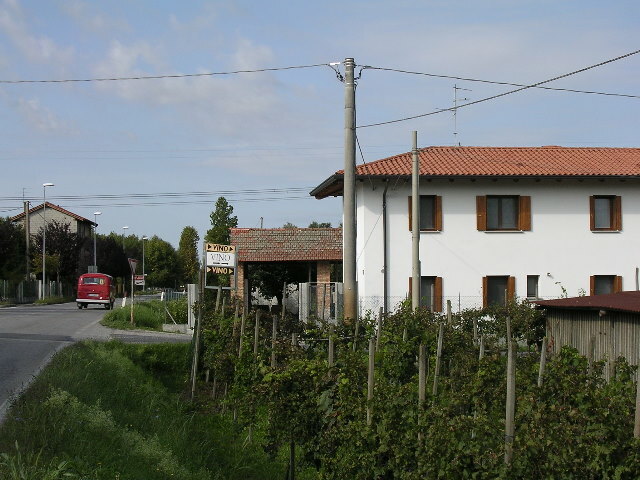 Rather, I arrived at Mestre, situated on the outskirts of Venice, only about 8 km away. I decided in the morning not to do anymore mountain climbing and chose to bypass Bassano del Grappa. The alternate route meant riding arond the mountain, which added about 50 km to the day's ride, but at least these were 50km that could be reasonably ridden. The weather was cool to start, about 10C, and sunny. This alternate route did take me to a major decent (1200m) down the face of a mountain, essentially taking me out of the Dolomites. The decent crossed from one end of the mountain face to the other, about 6 to 8 times. I just loved it and I have a deep appreciation for the ride earlier in the week that got me up there. This took me to the start of Veneto low lands. A noticeable change in temperature too, in the low 20s. The roads in these areas were hard to follow and I rode through many villages along the way. 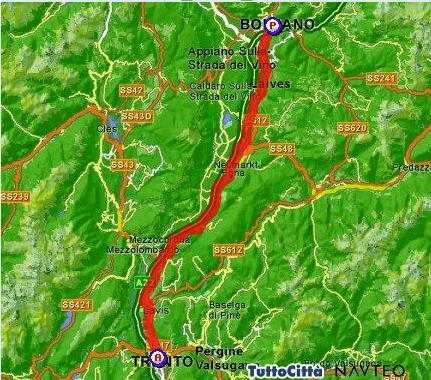 Also, the route seemed to draw me southwest towards Vicenza and I had to keep a close eye on finding roads in the desired eastern direction. Traffic was moderate to heavy, particularly after 3:00 pm. The wind was moderate at 10-15 km/hr from the west, SW. I arrived in Mestre about 5:30 pm. 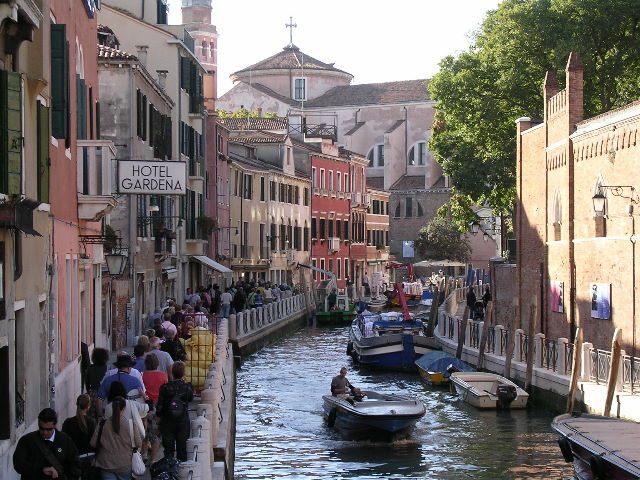 This is a very busy place, close to the traditional Venice sights and lots of tourists. I left early today (about 8:00 a.m.) with the intention of spending some sight seeing time in Venice before heading east to Latisana. The roads to Venice were very busy, with lots of cars and trucks. Not a nice place to cycle! Once entering Venice, it's like entering a different world. 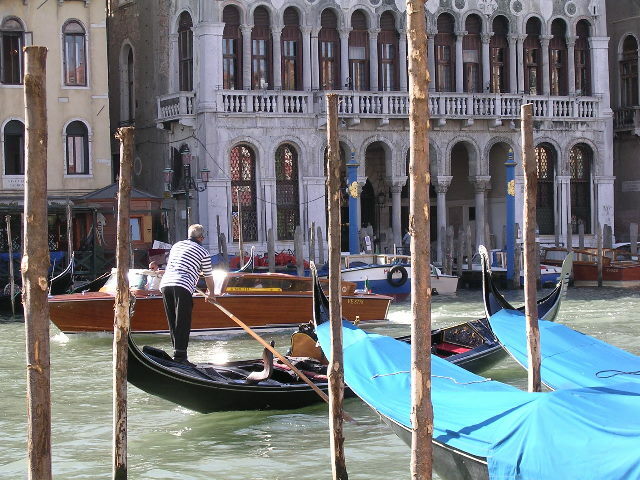 The canels are it's roads .... boats and gondolas are it's vehicles. I didn't anticipate the brdges to cross to get around the city. They're all steps - no ramps. It was very dfficult crossing these bridges with a full, pannier loaded bike. Not to mention the abuse the bike took. 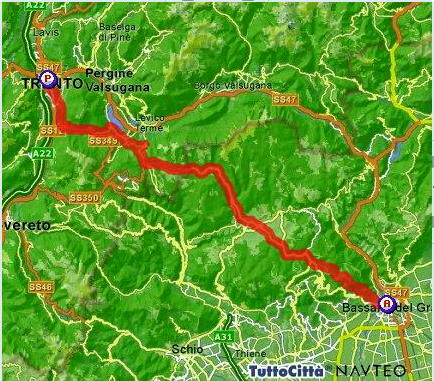 Tomorrow's ride is to Trieste where this cycling trip ends, about 80 km away. I will try to get my last and concluding email out tomorrow. Sunny, war/hot (26-28C), heavy traffic in Venice and immediate area. Moderate to light traffic to Latisana.. Moderate S to S/W tail wind. Flat terrain. I WONDER WHY PAUL DELCONTE TOOK A PICTURE OF THIS PLACE? My final day of the cycling trip went very well. There were no problems with finding my way out of Latisana. 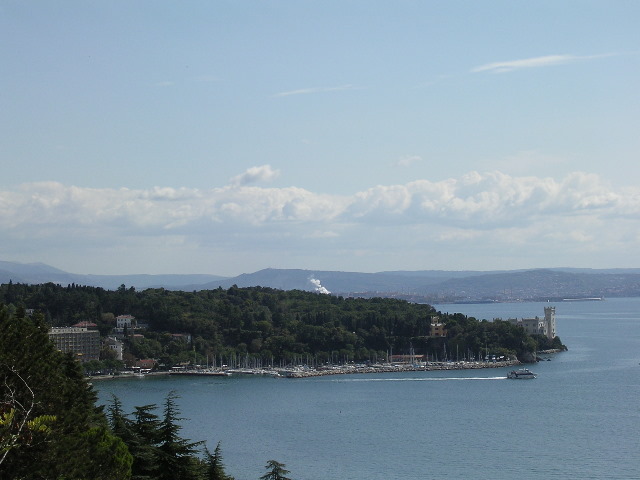 This route was well marked with signs directing me to the city port of Trieste. 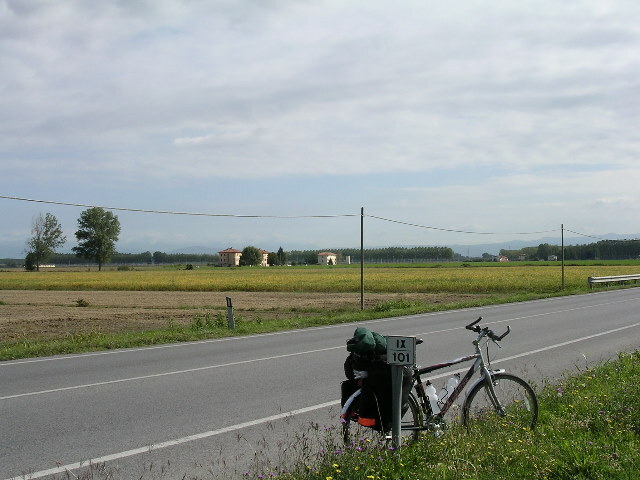 The main portion of the ride was in the southern Friuli region, farmland and the terrain is flat - traffic was light, making it easy to cycle. There was a light to moderate headwind from the east, but a beautiful day, with comfortable temperatures and sunny skies. In the last 15 km, after passing the shipyard city of Monfalcone, I did encounter a few minor climbs. 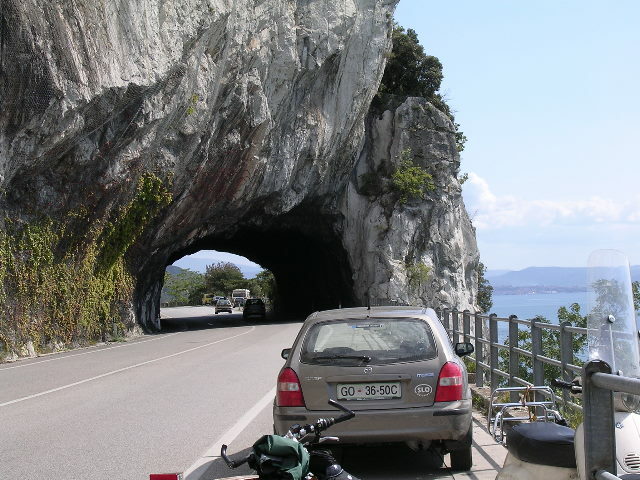 Also the remaining ride was a coastal route, the Adriatic sea to the right of me. What a spectacular view! Traffic increased and was heavy as I approached Trieste. 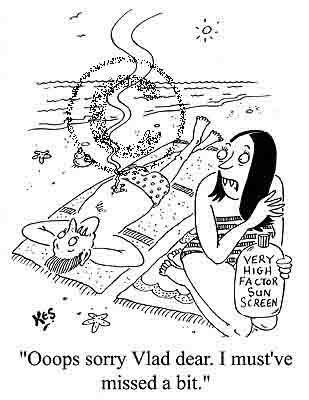 There were many sun bathers along the board walk. 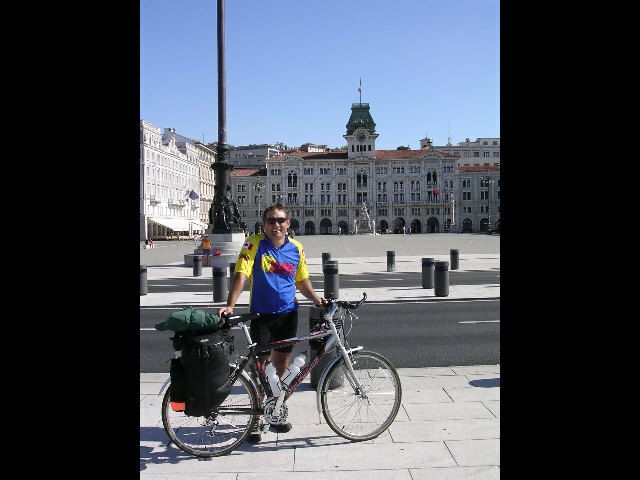 I arrived at Trieste's main square that overlooks the harbour (Piazza dell'Unita) at 3:00 pm to end this cycling trip. Here are some pics. I will try to get a concluding email summarizing this cycling trip out later today. 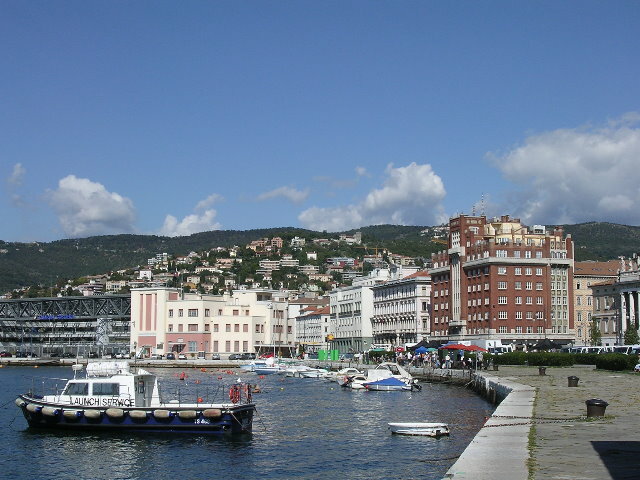 Partly cloudy to sunny, warm (22 -26C), light to moderate wind East South/East, Flat terrain with a few light climbs the last 15 km, heavy traffic into Trieste. "I'm not there yet, but I can see it from here"
My final notes on my Bolzano to Trieste tour. Flight to Munich was essentially on time and everything arrived in good condition. Some minor damage to the mounting strap of the cyclometer Reed Switch.....easily repaired. Rail to Bolzano had it's one significant complication with the originally booked train that evidently did not take bikes. I was fortunate that another train, accommodating bikes, was available, scheduled 2 hours later. I only made one reservation, that at Bolzano, due to expecting to arrive late and wanted to avoid searching for a room after a relatively long trip with it's consequential jet lag. Hotels were easy to find (but for my stay at Latisana) and prices were moderate to expensive, 50 to 100 € (75 to 150$ Cdn). Rooms included continental breakfast. The hotels require you to leave an ID document during your stay. I used my passport. All were paved and the majority of the roads were good to excellent condition. Only 1 dedicated bike path on this tour (Bolzano -Trento). A considerable amount of the the secondary roads taken did not have much of an shoulder to cycle. 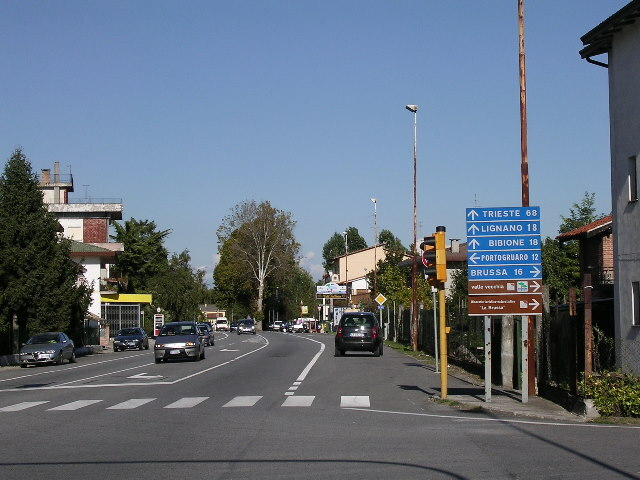 Traffic was a problem in the Mestre area. The severe climbing that AM, leaving Trento, I would not recommend unless you are prepared and there is a strong desire to do a 3000 ft climb over a mountain.. The weather was excellent. Warm comfortable temperatures. No rain. Some head winds but not significant enough to interfere with the ride. Spectacular mountain/valley scenery in the Trentino/Alto Adige area. Veneto's and Friuli farmland was serene and tranquil. Last 15 km coastal route was also spectacular with the mountains meeting the sea. The people were friendly and accommodating ...helps knowing the language and in particular, the local dialect :-). During my tour, my good friend Kevin Rodger with his creativity put together a webpage of my tour and accounts. Here's the link. Thanks Kevin.